An emergency technician tends to a patient with flu symptoms at a California hospital. The 2017-2018 flu season is hitting hard across the nation, including in Maine, where 22 adult deaths have been linked to the viral disease. Five adults in Maine died from the flu or related illnesses in the last week, bringing the number to 22 so far this season, compared to none at this time last year, according to data from the Maine Center for Disease Control and Prevention. Two K-12 schools also have reported outbreaks this season, one each in Kennebec and Somerset counties, along with three hospitals in York, Androscoggin and Knox counties. Maine CDC does not identify the facilities. Overall, 18 new outbreaks in institutional settings were reported in Maine last week. Hardest hit are Maine nursing homes, with a total of 52 facilities reporting outbreaks this season. Out of 1,749 Mainers so far with a positive lab diagnosis of influenza, a season total of 429 had been hospitalized as of last week, most them adults over 65. Last week alone, 91 hospitalizations were reported. That’s up significantly from last year’s flu season. At this point during the 2016-2017 season, 323 Mainers had positive lab results and 50 had been hospitalized, according to Maine CDC data. Efforts to connect with an epidemiologist at the Maine CDC for comment Wednesday were unsuccessful. At St. Joseph Hospital in Bangor, emergency physician Jonnathan Busko said about 10 to 15 patients per day seek emergency care for flu-like symptoms such as fever, coughs and sneezes, body aches and general misery. “For the very young, the very old and those with chronic disease like asthma or [lung disease], it’s a pretty significant illness,” he said. Still, many, especially otherwise healthy adults, are sent home with advice to rest, drink plenty fluids and stay away from others until they’re feeling better. “Most people [with flu] don’t even need to be seen at all,” Busko said, and are better off resting at home and keeping their germs to themselves. Some individuals come to the emergency department because they can’t get in to see their primary care providers for several days. Others have seen their providers recently but are still feeling sick. Sometimes, they hope to get a prescription for an oral antiviral medication, such as Tamiflu or Relenza. Like many providers, Busko is reluctant to prescribe antivirals except in specific circumstances, such as when a hospitalized patient is battling life-threatening complications. He references national guidelines that caution against using these medicines in garden-variety cases of flu, because they are of limited benefit and come with unpleasant and sometimes dangerous side effects. “Antiviral medications have very little place in the care of otherwise healthy people,” he said. The U.S. CDC and the National Academy of Pediatrics approve the use of some antivirals for the early treatment of influenza in children. 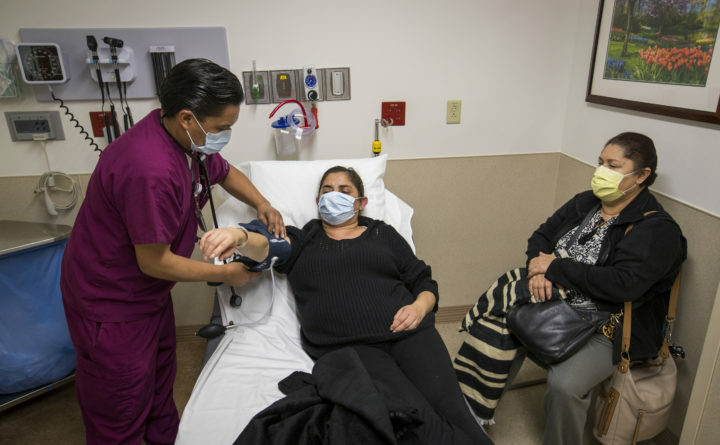 Patients Busko is most likely to admit to the hospital are typically older and have underlying chronic conditions, such as heart or lung disease, that may dangerously worsen with influenza. As inpatients, they’re likely to be treated with intravenous fluids, antiviral medications and, if warranted, antibiotics for secondary bacterial infections such as pneumonia. They’ll also have access to specialized respiratory therapy and other services as needed. Nationally, the 2017-18 flu season is reported to be especially severe, thanks to a particularly nasty strain of the virus that is only partially responsive to the protection provided by this year’s vaccine formulation. So far, 30 children have died due to flu across the country, including 10 just in the past week, according to the U.S. CDC. No pediatric flu deaths have been reported in Maine this season. Adult deaths are harder to quantify, as adult influenza is more likely to be complicated by other conditions. But both outpatient visits and hospitalizations for flu-like symptoms are higher than usual in Maine and across the nation, and there have been numerous reports of generally healthy individuals becoming seriously ill due to the flu. Experts say that even though it’s a less than ideal match for this year’s powerful flu strain, a vaccine is still the best prevention. People who are vaccinated and still contract the flu are likely to experience a shorter and less severe illness and are less likely to be hospitalized. It’s not too late in the season to benefit from a flu shot, still widely available through provider practices and retail pharmacies. “This is absolutely a good time to get the vaccine,” Busko said. It takes about two weeks to become fully effective, its benefits lasting throughout the remainder of the flu season, which typically runs into April or later. Other important steps to protect against this season’s virulent flu include covering coughs and sneezes, diligent handwashing, staying home when sick, and staying as healthy as possible through diet, exercise, stress management and rest.